The special characteristic of Maratea is the way it has excellently preserved all of its territory over time, in terms of the landscape and culture. The results are evident to visitors: a stretch of around 30 kilometers of perfectly preserved coastline featuring the typical Mediterranean scrub sloping down from the hills to the numerous beaches and coves, caves and footpaths. Maratea is truly a piece of paradise consisting of a mostly hilly patch of land dotted with lots of little villages overlooking the Tyrrhenian sea in the Basilicata region. 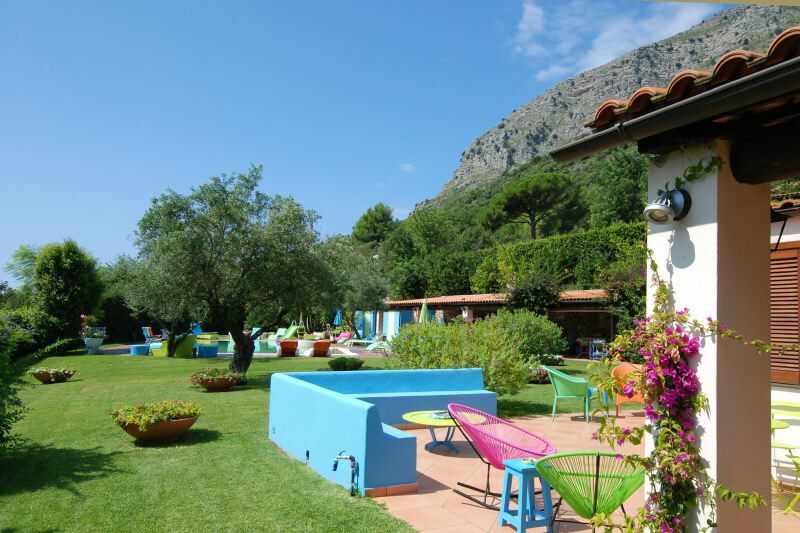 Although it is situated immediately south of the Amalfi and Cilento coasts, it has the advantage of being away from the busy tourist traffic that tends to block the local roads. 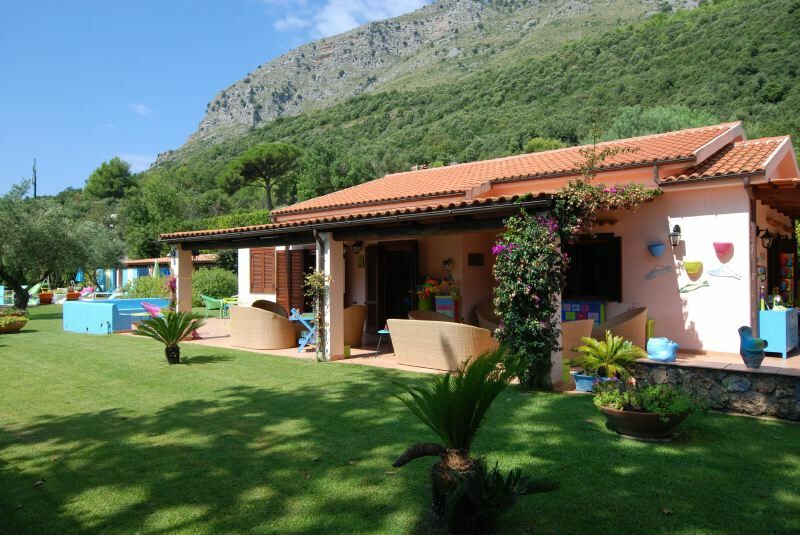 Villa Allegra in a panoramic position, surrounded by greenery, with views of the small town of Maratea and the mountain with the famous statue of Christ the Redeemer, a copy of the one in Rio De Janeiro. 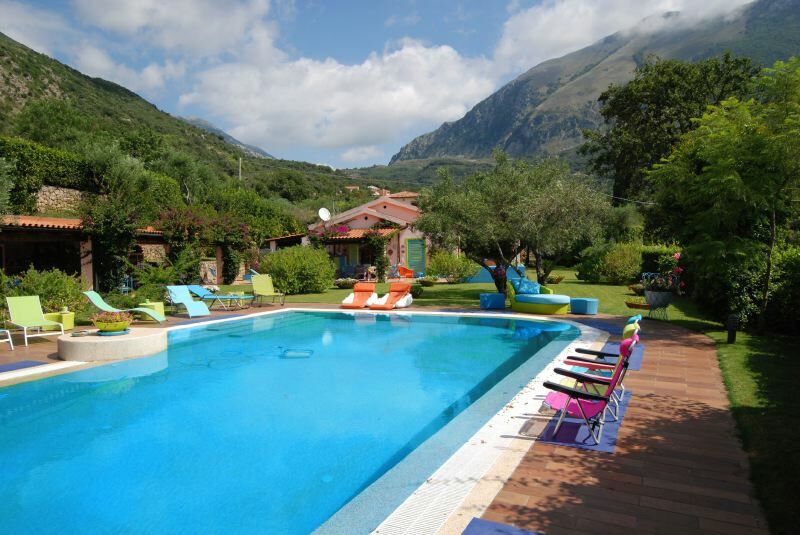 The villa is situated midway between the delightful town of Maratea and the sea. It is a detached property with a well-tended private fenced garden that contains numerous corners suitable for spendingoutdoor leisure time, a large private swimming pool (6x12m) and a patio fitted with a large kitchen complete with burners, oven and BBQ for eating “al fresco”. The villa is on one level with various access points to the garden, and features multicolored pieces of design furniture that create a lively, happy environment, as suggested by the name of the villa (allegra is Italian for “happy”). There are a number of beaches which are a maximum 10 minutes’ drive away (approx. 3 km): such as, for example, the beaches of Macarro, Illicini and Fiumicello, to name just a few. The property has a dishwasher, washing machine, Wi-Fi internet, BBQ, private swimming pool. GROUND FLOOR: Living/dining-room with access to the garden, kitchen with access to the garden; 3 double bedrooms of which two have en suite bathrooms with shower and one has access to the garden; bathroom with shower; small annex with access from the patio and a bedroom suitable for children, with 2 beds (bunk beds). DÉPENDANCE: 1 double bedroom, en suite bathroom with shower. Private swimming pool, large outdoor kitchen, private fenced garden.